After bombing most of my 2014 goals, I went back to the drawing board and decided to drastically simplify my goals for this year and focus on those that would really be soul-filling for myself and encourage me to really invest in my marriage and children. I spent a few weeks considering what worked and what didn’t work and what I wanted my priorities to be in 2015. After contemplating this, I wrote out a rough draft of my goals and then went over them with Jesse last week and he helped me refine and tweak them. I’ve been sitting on my finalized goal list for a week and I have to tell you that I’m so excited about these goals for 2015! They feel challenging but still realistic and this is making me all inspired and motivated — instead of feeling like I’d set goals that were so lofty inspiring and motivating. Read 1 book per month on marriage. Write at least 1 love note to Jesse each week. Read at least 1 book aloud to the kids per month. Write 1 love note to each child every month. Complete all She Reads Truth 2015 Bible Studies + memory work. Read 1 fiction book per month. Hire a local personal assistant. Launch our new product line (slated to soft launch in the summer). Release my third book (slated to come out November 2015). Increase last year’s overall giving totals by 10% in 2015. Finish funding our Rental House #3 Savings Account (we’re beginning the year at 35% funded). So there you have it! I’ll post updates at the beginning of each month to let you know the progress I made in the previous month. If you set goals for this year, I’d love to hear what they are! Leave a comment listing them or linking over to your blog post about them. Here’s to a year of living with purpose, intentional, impact, and meaning! Check out this post on 10 Questions for Moms to Ask in the New Year and 35 Spiritual Goal Ideas for the New Year. 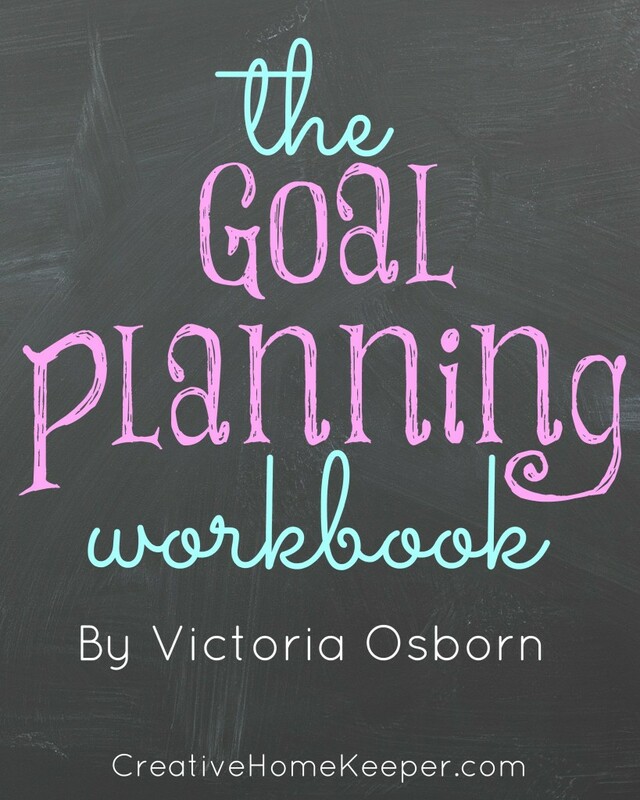 You can also sign up for a FREE Goal-Planning Workbook. Looking for more? Read more posts about 2015 Goals. I always love reading your goals. Sounds like you have a great year ahead! Thanks so much for the inspiration you constantly are to me! Good luck with your goals Crystal! I’m still finalizing my 2015 goals but I am excited about doing the 365 days of She Reads Truth 🙂 Happy New Year! Their new 365 app looks so good! I’m so glad that I discovered them this year. The monthly studies have been SUCH a blessing to me and have really reignited my passion for digging into the word of God and studying it in-depth. My husband bought me the Black Envelope Yearly Membership to their studies as my Christmas gift and it was pretty much my favorite gift ever. You have me very curious about She Reads Truth. Might have to check it out. I listed my goals for the year here.. http://snailpacetransformations.com/10-goals-2015/. Just got back from starting one with my redhead runner! We ran a cold 5 miles, she is going for 1000 miles in 2015 and I am going for 1200 miles. If we make our goals we are treating ourselves to a girls weekend away. Using pennies in jars to keep track. I love that you go over your goals with your husband! It’s so important to work as a team in life. You are a great example! I’d love to talk to you about your personal assistant position, once you’re hiring! I live in Nashville and have followed your page for several years now. We actively looking/interviewing right now. I’d love for you to send your resume to crystal @ moneysavingmom.com — thanks so much! Thanks so much, I’ll get that emailed to you right away! I would love to know what marriage books you are looking at! I struggle to find ones that I agree with/coming from a solid Biblical view. But it is something I want to make a priority. I’m reading more fun and practical marriage ones this year to encourage us to keep the sparks and fun in our marriage. I’ll be sharing them/review of them each month as part of my book review posts, so keep your eyes peeled for those and hopefully you’ll find a few ideas from the ones I read and like. My heart is where yours is this year, Brandy. You are such an inspiration! I’m thinking about getting a solar oven, as well. I just took a peek at your blog. That’s such an eye-opener for me, sad to say. Thank you for sharing your focus on preparedness. Thanks for being transparent and sharing your goals. My husband and I have been married for almost 8 years. We have always sat down together at the end if the year to draft out our individual and personal goals for the upcoming year. The past two years, I have been in survival mode with twin toddlers and a newborn and have felt to overwhelmed to plan ahead. Now that some of the sleep deprivation is gone, I am looking forward to our goals for the upcoming year! Good gravy. There were a lot of typos in my comment and no way to edit. Ha! Sorry! Excellent goals! I always feel inspired reading your goals for the new year. I was wondering, do you help your children set goals for each year? Yes, my husband sets goals just like mine (categorized and broken down) and then we encourage our children to each set 2-3 goals for the year. I hesitated to share my goals at first, but I thought it would be good for accountability, so I posted them on my blog. http://less2more.com/2014/12/30/smiling-at-the-future-my-2015-goals-2/ Thank you for always being so honest with your goal-setting and even times when you don’t meet them. It’s an encouragement to see how you can get back up again even after the setbacks. Gasp! Your book is coming out on my birthday! Whoops, I think I had the number 15 stuck in my head from writing 2015 so much today and wrote November 15, 2015 instead of November 2015!! I’m glad you said something so I could catch my typo! Thank you for being so transparent in sharing your life. I have learned a lot from you in the short time I have been reading your blog. Hi Crystal, I enjoyed reading about your goals. From an outside perspective I’d say you had a tremendous year; so you’re right, you should be celebrating not feeling like you came up short. I’m curious about your Rental House #3 savings account? My wife and I just celebrated being 100% debt free this week! Thanks Dave! We have some investment property so I’m curious to read anything you’ve written on it. Thanks. Happy New Year and many blessings to you!!! Sounds like an exciting year! I’m looking forward to the 2 courses you are planning! May your find beauty in the mundane and wisdom in life’s interruptions throughout the new year. I like how you made different categories for your goals! We did the same thing with different categories and then shared them as a family. It was fun to find goals we had in common! I LOVE you reading your goals! They are my favorite posts!! I can’t wait to read your weekly updates! My goals are to save more money, eat healthier, excercize more, cook more, eat out less and spend more time with my family! Thank you for sharing your 2014 & 2015 goals with such transparency! And for introducing me to She Reads Truth! I have really enjoyed the studies and look forward to continuing in 2015. I love these goals Crystal! I love how simple yet true to you they are. Your goals and goal posts have always inspired me to stay on task and to set goals that work for me. I am so excited to write mine out. 🙂 Thanks for all the encouragement. I really admire your drive for success, personal development and generousness as evidenced by these goals. Thanks for sharing, and happy new year! I’m surprised not to see any health/fitness related goals. I know you say that those actions often keep you feeling good and energized. Are they not goals because they are already ingrained habits after your 2014 year of healthy focused goals? Otherwise, thanks for sharing– you have a great list! Your goals always inspire me to reach for more than I used to think was possible for someone to do in a month/year. And it’s awesome to look back on a year and realize that we accomplished goals that seemed a bit out of reach in January. Thanks for being a good example! I had SO many other goals that I wanted to include on the list, but I decided to really focus on goals that would inspire me and be soul-filling for me and that felt realistic with what I already know that is going on in 2015. I went back and forth over whether to include a health/fitness goal, but because health had been such a focus of mine this past year and because I’d made such great new habits/changes, I decided to just stick with what I already have in place there. Crystal, looking at your financial goals, I would love to hear you elaborate on your rent house situation. Do you already have two rent houses and are saving for a third? Do you have them local? Are they vacation homes or everyday rentals? If they aren’t located where you are how do you manage the upkeep? I ask because we are aggressively saving to pay cash for our next house and then start investing in income properties and or land, but we haven’t decided what the best approach is yet, so I’d love to hear your angle. Thanks, and Happy New Year! Yes, we already have two. They are in Kansas and they are regular homes, not vacation rentals. One is the home we paid cash for and lived in before we moved to TN and the other is one we saved up to buy after we bought our house. Jesse works with a local rental management company in Kansas who take care of collecting payments, finding and vetting renters, and serving as the go-between. They take 9% of the profit and that’s been very worth it for the hassle they eliminate for us. I’m interested in the rental property goal as well. I noticed that you said in your previous post that you signed a two year lease for your current home. What made you decide to rent in Nashville vs buying another house for your family to live in? A LOT of reasons, but the biggest was that we aren’t familiar enough with the area, don’t know our long-term plans, and real estate is a lot more expensive where we’re at, so in order to pay cash for a house, we’d need to sell both houses in Kansas to have the capitol to buy a house here. We felt like moving was going to be complicated enough, without adding in looking for a house and selling two houses at the same time. As it stands, we’re really happy with the choice we made as it made the transition much smoother. We’re currently doing a lot of research into real estate here and deciding what we’re going to do long-term as far as housing. Thank you for sharing. I love this time of year to reflect on the previous year and look forward to the next! I’m also curious about your investment property — do you & Jesse act as the property managers, or do you hire that out? Jesse is still really hands on (because he loves to be) and hires out repair men when one of the houses needs work, follows up on the work, checks on the houses regularly, etc. rental house #3? I am confused, do you have 2 already? Yes, we have two houses that we own and rent out right now. One is the home we paid cash for and lived in before we moved to TN and the other is one we saved up to buy after we bought our house. That’s great! Thank you for explaining. If you have any recommended reading on the subject I’d love to hear what you recommend. Especially any sort of analysis on rental vs. vacation rentals vs. pure land as an investment. Thanks so much for being such an interactive blogger! Jesse’s the researcher at our house and I just asked him and he suggested Equity Happens (the book) and the Real Estate Guys podcast. We haven’t ruled out vacation rentals and are still considering that option, but we opted to start with rental homes first. Perfect, tell Jesse I said, “thank you.” We are driving through Tennessee on our way back home to Texas at the moment! Beautiful state, y’all made a great move! Have a wonderful new year in you new home state! We LOVE the beautiful scenery here… it kind of feels like we’re on vacation every day! I am also in the same boat of trying to save up money for rental #3. I like Dave Ramsey’s no-debt approach to life but I see the benefit of leverage here! I’ve done both approaches: Paid cash for my first house, and did a cash-out refinance (took on a mortgage) to purchase the 2nd. So glad to see you posting financial goals again. I always enjoyed seeing your progress for these compared to my family’s financial goals. 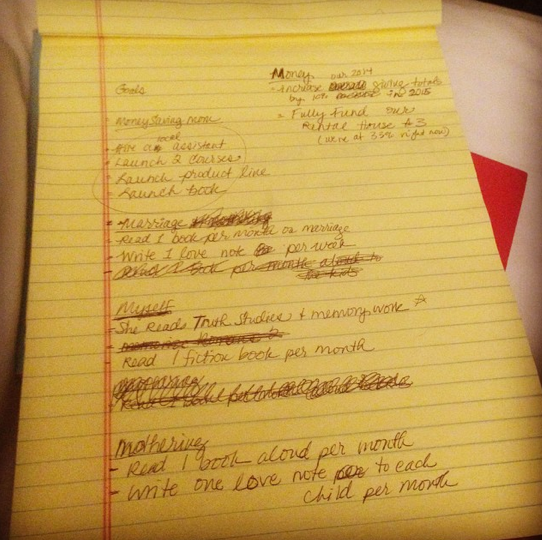 We are expecting our 4th child this spring so I know I need to keep my goals simple for 2015. Most of them don’t sound too exciting, but they will have a big impact on my life and my family. Yup, sleep, laundry, and food! These are GREAT goals — thanks for sharing!! Say Goodbye to Survival Mode inspired a group of us bloggers last year to blog about our goals each month and to cheer each other and help us through. I did good keeping up with setting and carrying through with goals in 2014 even though I stopped blogging about them around august. I LOVE this! Thanks so much for sharing! I’m grateful that the book inspired you! Great goals – I’m sure you’re going to have lots of success with them! Thanks for sharing, sounds like you’ll have a busy year! I’d be interested in hearing more about your rentals. We aren’t quite in the position to do something like that right now but my husband is so against it he won’t even discuss it as a possible income stream. Here are my goals for the year. Thanks for allowing us to share. Thanks for sharing your goals! And be sure to check through the comments on this post as I shared quite a bit more details about our rental properties in answer to questions people asked. I’m new to the goal setting thing, so I’m keeping it very simple. I have just one goal for 2015 and that is to get the house more organized as well as developing a cleaning routine so the house stays generally clean. Of course there are many other things I would like to do, but I think if I can improve in this area that will open up a lot more time in my life and as a full-time working mom of two small children I want to be realistic. I think it’s GREAT to just start with one goal. I’m cheering you on! Have you checked out flylady.net? I joined 5 years ago and my life has been a lot better and more organized and peaceful for it! Best of luck on your goals, Crystal. I have set a lofty goal for myself to pay off all of our family’s debt this year excluding our mortgage payment. I am also hoping to get my little etsy store off the ground (www.etsy.com/junkyardelves) and generate enough income each month to eventually quit my part-time job so I can spend more of my free time volunteering at my children’s schools. I’m cheering you on in your big goals!! Seems like that would be an encouragement to you! Here are my goals for this year! Thanks so much for sharing your goals! I’m cheering for your success in 2015! We decided in September to tackle $26K in debt for the next 12 months. We have paid off $7,300 so far, so my goal in 2015 is to pay off the remaining amount. What a huge relief that will be! You are making great progress. Good luck! Our “goals” are listed under the entry entitled “Ettle” . We try to balance setting aim and allowing for life’s ebb and flow. We use these guidelines as a compass instead of a map. God bless you for your transparency! I find this goal-setting post more helpful than the typical article on goals. I love reading about your goals. Are you guys planning on buying a home in TN? We’re still researching at this point what we want to do long-term and what the wisest financial strategy is. At this point, we’re actually enjoying the freedom that renting brings — especially because this house has ended up having so many issues and needing a lot of repairs as a result. Our landlords have been amazing! Shameless plug: if you’re considering an e-assistant. I would love to talk to you about it! I want to see a post on what your reading in 2015. I’ve only got 10 books on my list. I need to step up my reading list lol. I’ll be sharing my books read and short reviews each week here, so hopefully can get some ideas from those posts. Thank you for sharing your goals, Crystal. I always find it helpful to read other people’s goals/achievements! And thank you so much for sharing my post of 10 questions for Moms! Thanks for sharing your 2015 goals. We have two different goals. One for healthy living. Just like your created 12 different goals for each month in 2014, I created a set of goals to enhance our living in 2015. I’m sure these changes will be improve our lives quite a bit. The second goal contains family, finance, personal, and career. We simplified our goals this year by focusing just the essentials. My biggest goal for this year is to create lots of great content for my blog and work on marketing myself as a writer! http://blog.lauralindeman.com/first-day-of-the-rest-of-my-life/ This is a big, scary step but I am so excited. I also want to complete a sprint triathlon, learn to take better pictures, stop drinking Diet Coke, start freezer cooking once a month, and plan a big trip for my 5th wedding anniversary. Could you elaborate about the rental house income goal and what you’ve done to fund up to 35% already? Is there a blog post about this that I’ve missed? Thanks for all the inspiration and encouragement! ! We started working on saving for it towards the last half of 2014, so that’s why it’s funded 35% already. We are currently making that our main savings goal: so most of the extra income we earn after we pay our expenses, set aside money for tithe/giving and taxes and insurance and retirement, etc. + fund our cash envelopes goes into this fund. Reading your blog is always very inspiring to me, and I am excited for the goals that I have decided on for this year. I’ve never been very good at writing down goals and actually sticking to them, but that is something I am trying hard to change this year. 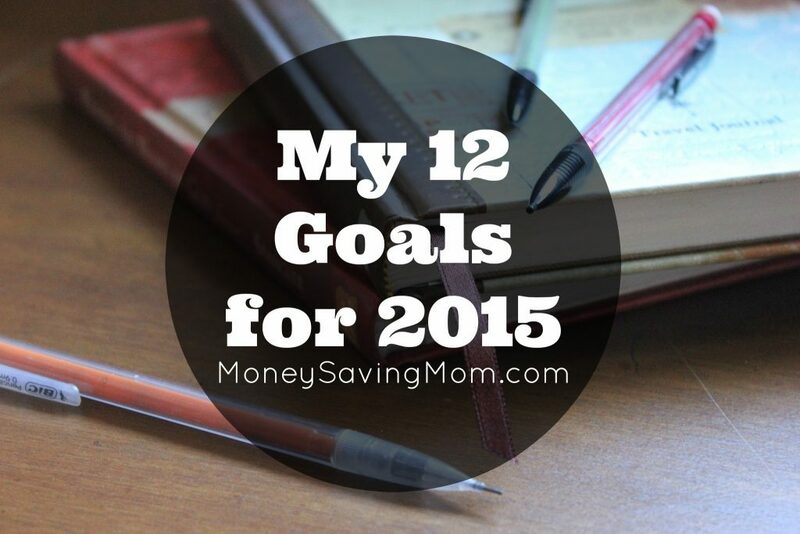 With that said, here are my goals for 2015 http://www.creatingahomemaker.com/?p=89. Thank you so much for all your motivation and inspiration. I so love and appreciate that you share your goals!!! It really does motivate me. My one word for the year is RUN (Hebrews 12:1-3), and a lot of my goals point towards that. I want to run more to the Lord, to seek Him more often and to put Him at the constant center of my marriage and parenting my 1 & 2 year olds. I want to run from fear that causes me to stop pursuing my ideas and goals. And I want to get in better health and shape so that I can run long distances again. I love that you divide your goals into categories! I’ll have to remember that for next year. I wrote about my goals for 2015 here: http://wildflowerfour.com/good-bye-2014-hello-2015/ Best of luck to you in 2015! Thanks for being so transparent with your priorities and goals. You really are inspiring! I love all of your more personal posts, but the goals are very encouraging. I’m new to writing out my yearly goals and don’t have a final list yet. Some of my goals are to read 3 chapter books per month to my kids, read 1 health/wellness/green living book for myself per month, have 1 stay in date with my husband per month, and get rid of $15k in debt over the year. My original debt goal was $10k but after blowing past my blog view goal for December I decided to try to push myself in other areas instead of just aiming for what seems easiest. I figured $15k in 2015 seemed appropriate. I have a tendency to over fill my to do’s so I’m trying to avoid that with my goals for the year, especially since baby number 3 is due in February. I’d like to know if you have any inexpensive bible study book reccomendations. I would love to have a bible study to go along with my bible reading but I have never really found anything that works. I have used the internet ones before but it is really not relaxing doing bible study while sitting at the computer desk. As far as yearly goals..last year I set some and I think I lost the notebook and totally did not keep any. We moved to nashville in august so that made a big difference. And now I’m really scared to set any goals because we are moving….back to new york and I just feel like I’ll be disappointed if I set any. Not only that but our fourth baby is due in may and we already have 3 little ones who take alot of time. I’d like to set organizational goals, goals for my bible reading and goals for my marriage and children…but it just seems like its never going to work out. I love writing goals almost as much as I love crossing them off! I finally finished mine for this year. I also find it helpful to organizing my goals by different areas of my life. http://www.traditionallymodernmom.blogspot.com Thanks for sharing yours and being such an encouragement! I love the transparency we get from your posts! I am so thankful for your honesty about missing the goals in some areas for 2014! I have been so inspired by your list that I have sat down over the last few days and made out a list of goals for our family for 2015. I am excited to have a goal & focus – now to break them down into smaller monthly/weekly goals so they don’t seem daunting and I have a better chance at meeting them all by year end!